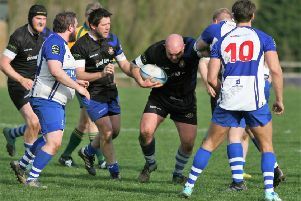 Shipston-on-Stour must win at Coventry Welsh on Saturday to stay ahead in the promotion race. That’s because the Rams lost 22-15 against Berkswell & Balsall in Saturday’s Midlands Three West South fixture at Mayo Road. With Old Leamingtonians winning it means Shipston’s advantage in second place has been cut to five points with two matches remaining. Shipston were left to rue several poor errors and missed chances as they slipped to only their fourth defeat of the season. The Rams were aiming to push ever closer to promotion but were unable to secure the vital victory. Shipston struggled to get out of second gear for most of the first half, struggling to retain possession for any decent periods. The visitors came with a good game plan and executed it well, shifting play away from the forwards to use their big runners in the centre of the pitch. It was a tactic that paved the way for much success as Shipston were sloppy in defence and gave away far too many penalties, allowing B&B’s to gain a real stronghold on the match. The visitors went 7-0 up before Shipston wrestled the momentum and piled the pressure on. Frustratingly for the Rams, the visitors spoiled their momentum with countless penalties before the referee finally issued a yellow card for repeated infringements. Shipston made the most of the numerical advantage, through a penalty over from Rob James and a try from Dan Taylor to edge ahead but the visitors slotted a penalty of their own to lead 10-8 at halftime. The game was a very tight contest but Shipston gave away several poor penalties at crucial periods of the second half. The visitors took full advantage of the errors and ill-discipline and were gifted a second try midway through the half. Shipston finally went through some good phases and working their way down the pitch towards the try line. Their hard work was rewarded when Tom Corby went over, converted by James. From the restart, Shipston played some excellent rugby, off-loading well and running some brilliant support lines to take themselves into the 22. But, with the try line beckoning, the ball was gathered by the visitors’ fullback who raced clear to score.